I’ve formed my own opinion on sealed resin models, but the jury is still out on sealed diecast cars. I’ll take metal over plastic any day, but what are the benefits if neither will offer me opening parts? 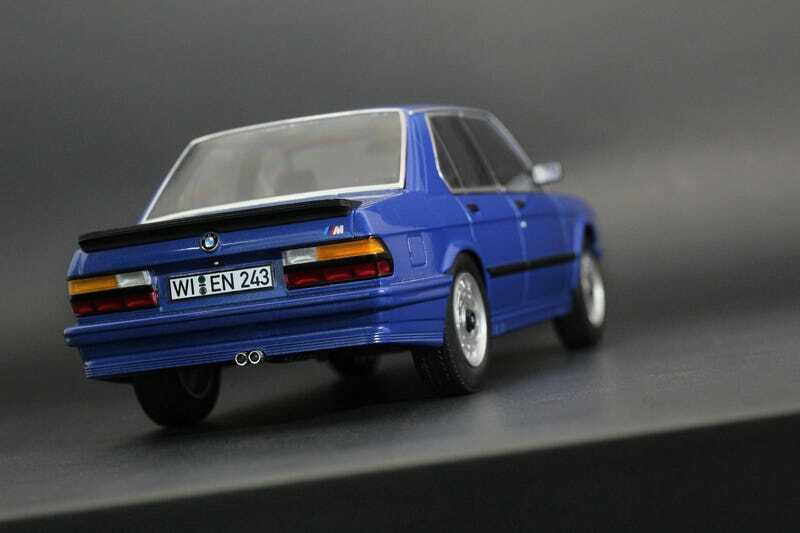 This is the 1987 BMW E28 M5 from Norev which is, as you may have guessed, a sealed diecast model. We all know and understand the economics that the production costs are going nowhere but up diecast manufacturers. Labor costs are getting more expensive in China and there’s constant competition of building a high quality, fully detailed tiny cars from other manufacturers. Resin models are the future, there’s no doubt. I’m beating a dead horse. It makes so much business sense for manufacturers as it’s cheaper to produce resin molds, and limited editions are a by product of the usable life of that mold. Still, a lot of your “old school” collectors can’t fathom spending serious money on a lump of plastic, not matter how awesome the car is. Some companies are offering sealed diecast cars as an alternative. Obviously, if there’s no opening parts, there’s no need to spend R&D money on a detailed engine bay, no need to account for the trunk, and all of the hardware needed for these parts to open. However, just like resin models, those cost savings aren’t getting passed on to the consumer. This Norev set me back $80, about the same as one of my Ottomobiles. Unfortunately, it’s just not as good. The casting lines for the panel gaps aren’t distinguished enough, and the paint job isn’t as rich as an Otto. The vents and grills are blatantly sealed off and painted on. The lights are good, just not as good as the Ottos’ I showed off this week. Then there’s the wheels. Besides the God awful style they opted to go with, the suspension looks set up for an off-road rally and the sidewalls are taller than the tower at the Munich headquarters of BMW. The wheels turn, but don’t steer, and they’re connected by a shared axle, just like the sealed Toyota 2000GT I brought out for Car Week. Feels too much like a kit car to me. All things considered, there’s no way I’m going to add a proper AutoArt E28 M5, like the one Pillarless Coupe showed this week, to my collection. Anyone want to team up for an elaborate Las Vegas casino heist though? Maybe then I can afford one.